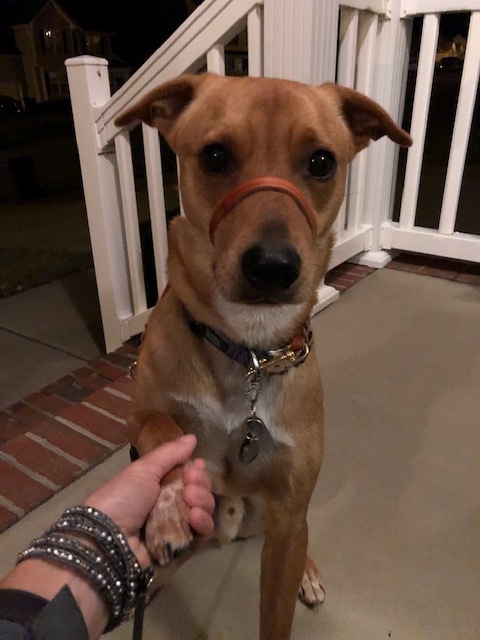 So far, my new rescue pup Wally & I have focused on practicing basic obedience commands like “sit,” “down,” “stay,” and “come,” but we hadn’t started working on any tricks yet. I figured one of the easier tricks to teach would be something involving his paws because he already likes lifting and crossing them. So we spent the last 4 weeks focusing on the “shake” trick. Note that when I say “the last 4 weeks” I mean that we practiced 4-5 times per day for about 2-3 minutes per session, so we took it very easy and did not have a deadline by which Wally needed to have the “shake” trick down pat. We’ve made a good amount of progress with this trick and are at the point where he will shake my hand reliably in exchange for a treat. My hope is that he will be able to perform the behavior with or without treats within another 4 weeks. 1. Ask your dog to sit while you hold a treat in your closed hand. 2. Show the hand with the treat to your dog. 3. Encourage your dog to paw at your treat hand. If your dog paws at your hand with the treat, say “yes” or use a clicker to mark the behavior. Then open that hand and let him have the treat. 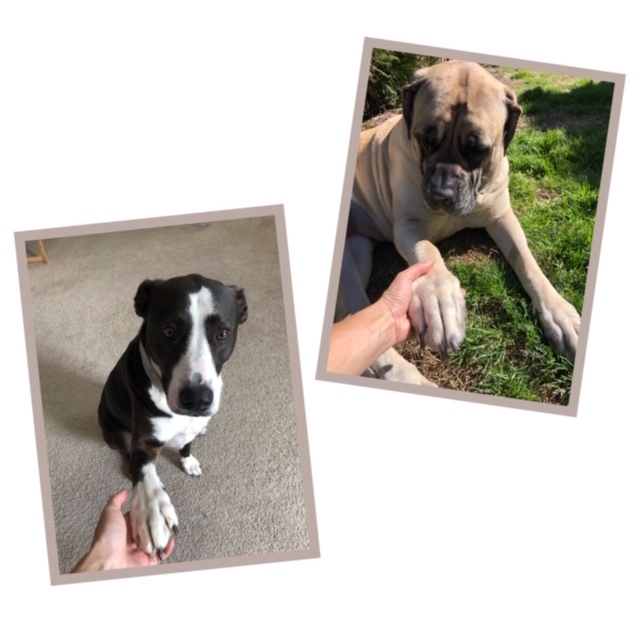 Shake your dog’s paw with your other hand. Say “shake” or “paw” or whatever word you want your dog to associate with that behavior. 4. If your dog doesn’t paw at your hand right away, you’ll have to find a different way of getting him to lift his paw. You could tickle him behind his paw and then reward him with a treat as soon as he lifts his paw up just a little. Wally & I demonstrate this in the video I posted on Instagram. This training method of rewarding small steps on the way of performing a certain behavior is called shaping. Don’t forget to praise your dog for a job well done! You can also take a slightly different training approach by using a behavior your dog already performs in your favor. Some dogs like to use their paws and will lift them up without being asked. As mentioned above, Wally does this sometimes. 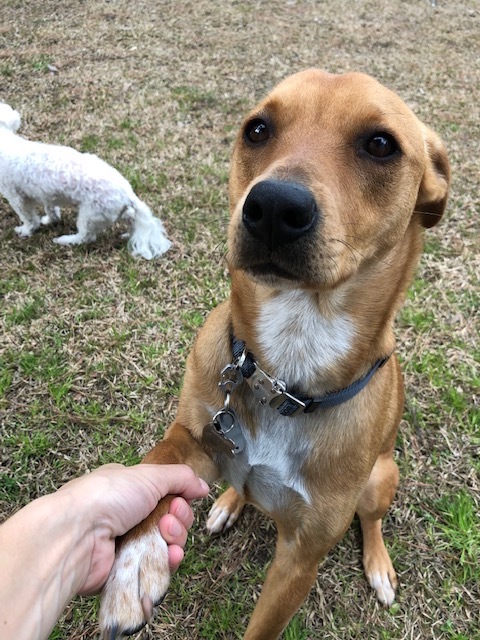 When your dog lifts a paw, simply take their paw with one hand while saying “yes” or clicking, then add “shake” while giving him a high value treat. This training method is called behavior capture. It’s ideal to have several short training sessions throughout the day and to repeat the exercise about 5 times per session. 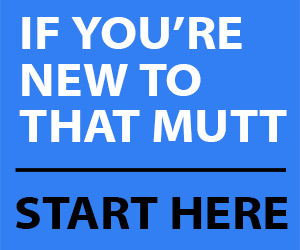 What you don’t want to repeat though is the command itself since you’ll want your dog to listen the first time you say it. I learned that valuable lesson when reading Patricia McConnell’s book The Other End of The Leash several years ago. It’s generally a great idea to shake training sessions up a bit, pun intended! Practicing the very same obedience command or trick over and over again can get boring for both you and your dog quickly, so think about incorporating another fun trick to keep things interesting! You could even create a little routine consisting of a variety of obedience commands and tricks, like a “sit-stay” followed by a “come,” “shake,” and “spin”! It’s guaranteed to stimulate your dog on a mental basis and strengthen the bond between you and him while practicing the routine together. They’re where I found inspiration for trick training and games to play with my former pups Missy & Buzz, “shake” and “hide & seek” being two of them. I started teaching Wally the “shake” trick inside my house because it’s a fairly neutral environment without too many distractions. After about a week, I began practicing outside with him as well. First in the backyard, then on walks and while out and about running errands together as well. The most common position a dog performs the “shake” trick in is probably the “sit” position, but you can also practice “shake” while your dog is in a “down” or even a standing position. 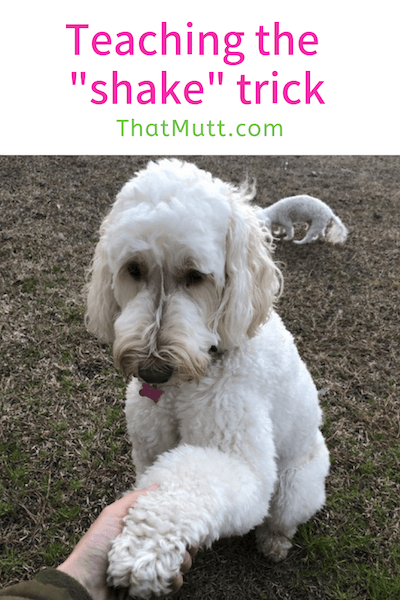 The “shake” trick is a fun and relatively easy trick to teach that almost every dog should be able to learn. Once Wally will have mastered the “shake” trick, I’d like to work with him on “High-Fiving” me! Does your dog know the “shake” trick? How did you teach it? Mine knows it! She will shake using either her left paw (“shake left”) or right (“shake”). She will do a high five and left five also. I cue her by mirroring (so my left hand for a regular shake and my right hand for a shake left). We did it by a shaping method similar to yours, I think. She just kind of started offering it and caught on quickly when it was rewarded, so I have trouble remembering.